At the end of the exam, you need to hand in your exam, the blue exam booklets, and your scantron form. All items must be clearly labeled with your name, your student ID number, and your workshop day/time. If any of these items is missing, we will not grade your exam, and you will receive a score of 0 points. Under what conditions does the equation apply for a system of particles? 2. Only if the system consists of a single particle. 3. Only if the center of mass of the system is at rest. 4. If the quantities are calculated in an inertial reference frame or about the center of mass. 1. that is directly away from the axis of rotation. 3. that is equal to the velocity of the center of mass of the initial object. 4. that is equal to its velocity on the surface of the object at the moment it is ejected. What happens to the precession rate of a spinning top as the angular velocity of the top about its axis decreases? 1. The precession rate remains constant. 2. The precession rate decreases. 3. The precession rate increases. 4. It depends on the angle of tilt of the top. What statement is necessarily true for a system that has no net torque and no net force acting on it? 1. The system is in static equilibrium. 2. The system is in stable static equilibrium. 3. The system is not in equilibrium. 4. The system is not undergoing translational or angular acceleration. The amplitude of a damped harmonic oscillator decreases to half its initial amplitude in time t. How much longer does it take for the amplitude to reduce to one-fourth of its original amplitude? Match the pictures of the ball parks shown above to the team names listed below. Two identical blocks, each of mass M, are connected by a light string over a frictionless pulley of radius R and rotational inertia I (see Figure). The string does not slip on the pulley, and it is not known whether or not there is friction between the plane and the sliding block. When the system is released, it is found that the pulley turns through an angle q in time t and the linear acceleration of the blocks is constant. a) What is the angular acceleration a of the pulley? b) What is the linear acceleration a of the two blocks? c) What are the tensions T1 and T2 in the upper and lower sections of the strings? Express all your answers in terms of M, R, I, q, t, and g.
The system shown in the Figure below is in equilibrium. The mass of the block hanging from the end of the strut S is M, and the mass of the strut itself is m. The density of the strut S is homogeneous. a) Find the tension T in the cable. 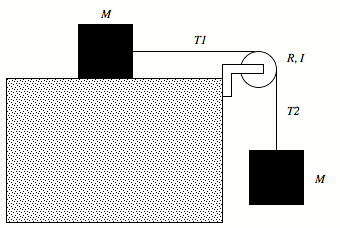 b) Find the horizontal and vertical force components exerted on the strut by the pivot P.
Express all your answers in terms of m, M, and g.
A solid cylinder of mass M is attached to a horizontal massless spring so that it can roll without slipping along a horizontal surface, as shown in the Figure below. The spring constant of the spring is k. The system is released from rest at a position in which the spring is stretched by a distance d.
a) What is the translational kinetic energy of the cylinder when it passes through the equilibrium position? b) What is the rotational kinetic energy of the cylinder when it passes through the equilibrium position? c) Under these conditions the center of mass of the cylinder executes a simple harmonic motion. What is the period of this motion? Express all your answers in terms of M, k, and d.